It doesn't happen very often that I buy a single for the B-side, but in this instance, I did. 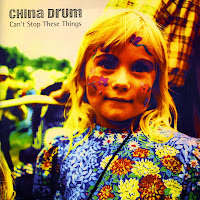 China Drum recorded a cover of Kate Bush's 'Wuthering heights' and it was included on the B-side of the single 'Can't stop these things'. In 1996, which is when this single was released, 7" vinyl singles were becoming increasingly rare, but British indie bands still released singles on that format quite a lot. The single had a one week run in the UK singles charts, at number 65.